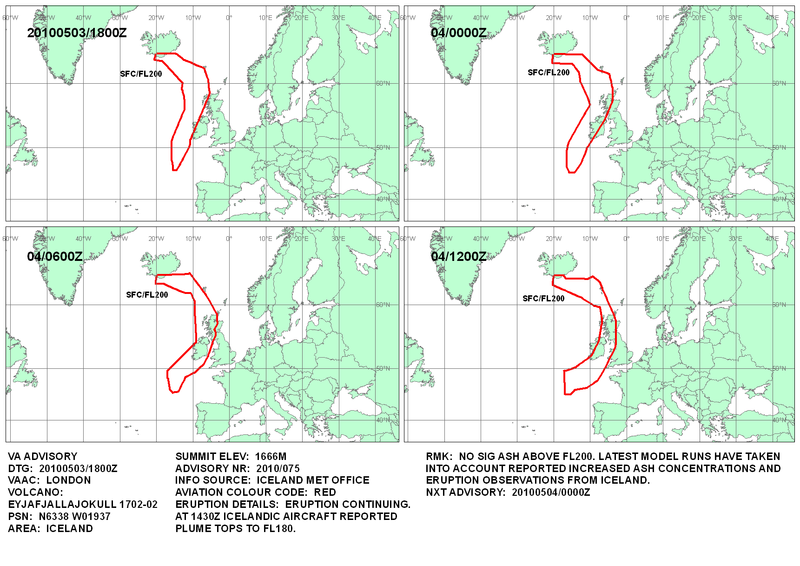 The Irish Aviation Authority (IAA) has re-imposed a total flight ban on Ireland’s airspace for a six-hour period tomorrow because of the hazard presented by airborne ash from the Eyjafjallajökull eruption in Iceland. All flights into and out of Irish airports will be banned from 06:00 to 12:00 GMT on 4 May 2010, although overflights of Ireland from the UK and Europe will not be affected. The IAA statement on the closure is here: IAA forced to restrict flights in Irish airports. In the United Kingdom there is a possibility that Scottish airspace may be affected as the ash moves eastwards, although the UK authorities are currently waiting for further Met Office and VAAC reports on the nature and movement of the ash cloud. This cloud is denser than the plume which caused all the problems last month, but smaller in extent, so it may be easier for aircraft to re-route around it. The latest volcanic ash advisory (in graphic PNG form) from London VAAC (archive here) reports Eyjafjallajökull plumes reaching FL180 (18,000 feet / 5,500 metres altitude) this afternoon, but no significant ash above FL200 (20,000 feet / 6,000 metres altitude). UPDATE 4 May 2010. Republic of Ireland and Northern Ireland airspace has re-opened, but in Scotland airports in the Outer Hebrides will remain closed until later this afternoon (source: BBC).